or call 06 75 48 51 97 or 04 92 43 39 90. Possibility to pay in check, vacation checks, species, bank transfer. Preferential rates apply to family and groups of more than 5 people. The base is open from 1 May to 31 August, from 9 am to 9 pm. 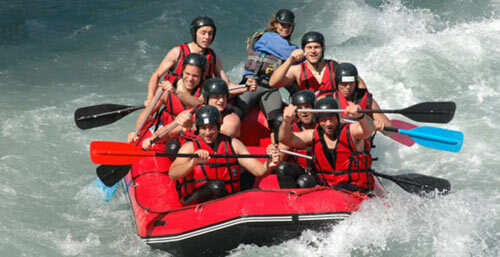 Situated along the river Durance about Embrun at the end of white water course and at the entrance of Serre-Ponçon. Framed by qualified instructors We offer to accompany you safely on baptisms and improvements rafting, hydrospeed, canoeing and air kayak. We will equip you for your comfort in neoprene suit and socks, life jacket and helmet. All materials necessary for practicing your favorite sports whitewater is provided except shoes and swimwear. Plan to bring with you the linen and spare shoes. Afoot, stroll around the lake Embrun is located 500m from our base.